Proprietary Name: Losartan Potassium What is the Proprietary Name? Non-Proprietary Name: Losartan Potassium What is the Non-Proprietary Name? Losartan Potassium with NDC 60760-125 is a a human prescription drug product labeled by St. Mary's Medical Park Pharmacy. The generic name of Losartan Potassium is losartan potassium. The product's dosage form is tablet, film coated and is administered via oral form. FDA Application Number: ANDA090083 What is the FDA Application Number? A starting dose of 25 mg is recommended for patients with possible intravascular depletion (e.g., on diuretic therapy). ™ mixture to the tablet and water slurry in the PET bottle and shake for 1 minute to disperse the ingredients. The suspension should be refrigerated at 2 to 8°C (36 to 46°F) and can be stored for up to 4 weeks. Shake the suspension prior to each use and return promptly to the refrigerator. Losartan Potassium Tablets USP, 25 mg are green colored, oval shaped, biconvex film-coated tablets debossed with ‘E’ on one side and ‘45’ on other side.Losartan Potassium Tablets USP, 50 mg are green colored, oval shaped, biconvex film-coated tablets debossed with ‘E’ on one side and ‘4’ and ‘6’ separated by scoreline on other side.Losartan Potassium Tablets USP, 100 mg are green colored, oval shaped, biconvex film-coated tablets debossed with ‘E’ on one side and ‘47’ on other side. Losartan potassium tablets are contraindicated: In patients who are hypersensitive to any component of this product. For coadministration with aliskiren in patients with diabetes. Because clinical trials are conducted under widely varying conditions, adverse reaction rates observed in the clinical trials of a drug cannot be directly compared to rates in the clinical trials of another drug and may not reflect the rates observed in practice. Hypertension Losartan potassium has been evaluated for safety in more than 3300 adult patients treated for essential hypertension and 4058 patients/subjects overall. Over 1200 patients were treated for over 6 months and more than 800 for over one year. Treatment with losartan potassium was well-tolerated with an overall incidence of adverse events similar to that of placebo. In controlled clinical trials, discontinuation of therapy for adverse events occurred in 2.3% of patients treated with losartan potassium and 3.7% of patients given placebo. In 4 clinical trials involving over 1000 patients on various doses (10 to 150 mg) of losartan potassium and over 300 patients given placebo, the adverse events that occurred in ≥2% of patients treated with losartan potassium and more commonly than placebo were: dizziness (3% vs. 2%), upper respiratory infection (8% vs. 7%), nasal congestion (2% vs. 1%), and back pain (2% vs. 1%). The following less common adverse reactions have been reported: Blood and lymphatic system disorders: Anemia. These studies demonstrate that the incidence of cough associated with losartan therapy, in a population that all had cough associated with ACE-inhibitor therapy, is similar to that associated with hydrochlorothiazide or placebo therapy. Cases of cough, including positive re-challenges, have been reported with the use of losartan in postmarketing experience. Hypertensive Patients with Left Ventricular Hypertrophy In the Losartan Intervention for Endpoint (LIFE) study, adverse reactions with losartan potassium were similar to those reported previously for patients with hypertension. Nephropathy in Type 2 Diabetic Patients In the Reduction of Endpoints in NIDDM with the Angiotensin II Receptor Antagonist Losartan (RENAAL) study involving 1513 patients treated with losartan potassium or placebo, the overall incidences of reported adverse events were similar for the two groups. Discontinuations of losartan potassium because of side effects were similar to placebo (19% for losartan potassium, 24% for placebo). The adverse events, regardless of drug relationship, reported with an incidence of ≥4% of patients treated with losartan potassium and occurring with ≥2% difference in the losartan group vs. placebo on a background of conventional antihypertensive therapy, were asthenia/fatigue, chest pain, hypotension, orthostatic hypotension, diarrhea, anemia, hyperkalemia, hypoglycemia, back pain, muscular weakness, and urinary tract infection. In patients who are elderly, volume-depleted (including those on diuretic therapy), or with compromised renal function, coadministration of NSAIDs, including selective COX-2 inhibitors, with angiotensin II receptor antagonists (including losartan) may result in deterioration of renal function, including possible acute renal failure. These effects are usually reversible. Monitor renal function periodically in patients receiving losartan and NSAID therapy. The antihypertensive effect of angiotensin II receptor antagonists, including losartan, may be attenuated by NSAIDs, including selective COX-2 inhibitors. Dual blockade of the RAS with angiotensin receptor blockers, ACE inhibitors, or aliskiren is associated with increased risks of hypotension, syncope, hyperkalemia, and changes in renal function (including acute renal failure) compared to monotherapy. The Veterans Affairs Nephropathy in Diabetes (VA NEPHRON-D) trial enrolled 1448 patients with type 2 diabetes, elevated urinary-albumin-to-creatinine ratio, and decreased estimated glomerular filtration rate (GFR 30 to 89.9 mL/min), randomized them to lisinopril or placebo on a background of losartan therapy and followed them for a median of 2.2 years. Patients receiving the combination of losartan and lisinopril did not obtain any additional benefit compared to monotherapy for the combined endpoint of decline in GFR, end stage renal disease, or death, but experienced an increased incidence of hyperkalemia and acute kidney injury compared with the monotherapy group. In most patients no benefit has been associated with using two RAS inhibitors concomitantly. In general, avoid combined use of RAS inhibitors. Closely monitor blood pressure, renal function, and electrolytes in patients on losartan potassium and other agents that affect the RAS. 2 basis). These findings are attributed to drug exposure in late gestation and during lactation. Significant levels of losartan and its active metabolite were shown to be present in rat fetal plasma during late gestation and in rat milk. in utero exposure to losartan potassium: If oliguria or hypotension occurs, direct attention toward support of blood pressure and renal perfusion. Exchange transfusion or dialysis may be required as means of reversing hypotension and/or substituting for disordered renal function. Limited data are available in regard to overdosage in humans. The most likely manifestation of overdosage would be hypotension and tachycardia; bradycardia could occur from parasympathetic (vagal) stimulation. If symptomatic hypotension should occur, supportive treatment should be instituted. Neither losartan nor its active metabolite can be removed by hemodialysis. Losartan potassium USP is a white to off-white powder with a molecular weight of 461.01. It is freely soluble in water, soluble in alcohols, and slightly soluble in common organic solvents, such as acetonitrile and methyl ethyl ketone. Oxidation of the 5-hydroxymethyl group on the imidazole ring results in the active metabolite of losartan.Losartan potassium is available as tablets for oral administration containing either 25 mg, 50 mg or 100 mg of losartan potassium and the following inactive ingredients: microcrystalline cellulose, lactose monohydrate, pregelatinized starch (maize), low substituted hydroxypropyl cellulose, magnesium stearate, hydroxypropyl cellulose, hypromellose 6 cP, titanium dioxide, FD&C blue #2/indigo carmine aluminum lake, D&C yellow #10 aluminum lake, and purified water.Losartan potassium tablets USP, 25 mg, 50 mg and 100 mg contain potassium in the following amounts: 2.12 mg (0.054 mEq), 4.24 mg (0.108 mEq) and 8.48 mg (0.216 mEq), respectively. Losartan inhibits the pressor effect of angiotensin II (as well as angiotensin I) infusions. A dose of 100 mg inhibits the pressor effect by about 85% at peak with 25 to 40% inhibition persisting for 24 hours. Removal of the negative feedback of angiotensin II causes a doubling to tripling in plasma renin activity and consequent rise in angiotensin II plasma concentration in hypertensive patients. Losartan does not affect the response to bradykinin, whereas ACE inhibitors increase the response to bradykinin. Aldosterone plasma concentrations fall following losartan administration. In spite of the effect of losartan on aldosterone secretion, very little effect on serum potassium was observed. The effect of losartan is substantially present within one week but in some studies the maximal effect occurred in 3 to 6 weeks. In long-term follow-up studies (without placebo control) the effect of losartan appeared to be maintained for up to a year. There is no apparent rebound effect after abrupt withdrawal of losartan. There was essentially no change in average heart rate in losartan-treated patients in controlled trials. 14C-labeled losartan, about 45% of radioactivity is recovered in the urine and 50% in the feces. Neither losartan nor its metabolite accumulates in plasma upon repeated once-daily dosing. Use in Specific Populations (8.8)]. Drug Interactions No clinically significant drug interactions have been found in studies of losartan potassium with hydrochlorothiazide, digoxin, warfarin, cimetidine and phenobarbital. However, rifampin has been shown to decrease the AUC of losartan and its active metabolite by 30% and 40%, respectively. Fluconazole, an inhibitor of cytochrome P450 2C9, decreased the AUC of the active metabolite by approximately 40%, but increased the AUC of losartan by approximately 70% following multiple doses. Conversion of losartan to its active metabolite after intravenous administration is not affected by ketoconazole, an inhibitor of P450 3A4. The AUC of active metabolite following oral losartan was not affected by erythromycin, an inhibitor of P450 3A4, but the AUC of losartan was increased by 30%. The pharmacodynamic consequences of concomitant use of losartan and inhibitors of P450 2C9 have not been examined. Subjects who do not metabolize losartan to active metabolite have been shown to have a specific, rare defect in cytochrome P450 2C9. These data suggest that the conversion of losartan to its active metabolite is mediated primarily by P450 2C9 and not P450 3A4. th percentile level for the patient’s age, gender, and height. At the end of three weeks, losartan reduced systolic and diastolic blood pressure, measured at trough, in a dose-dependent manner. Overall, the two higher doses (25 to 50 mg in patients <50 kg; 50 to 100 mg in patients ≥50 kg) reduced diastolic blood pressure by 5 to 6 mmHg more than the lowest dose used (2.5 mg in patients <50 kg; 5 mg in patients ≥50 kg). The lowest dose, corresponding to an average daily dose of 0.07 mg/kg, did not appear to offer consistent antihypertensive efficacy. When patients were randomized to continue losartan at the two higher doses or to placebo after 3 weeks of therapy, trough diastolic blood pressure rose in patients on placebo between 5 and 7 mmHg more than patients randomized to continuing losartan. When the low dose of losartan was randomly withdrawn, the rise in trough diastolic blood pressure was the same in patients receiving placebo and in those continuing losartan, again suggesting that the lowest dose did not have significant antihypertensive efficacy. Overall, no significant differences in the overall antihypertensive effect of losartan were detected when the patients were analyzed according to age (<, ≥12 years old) or gender. While blood pressure was reduced in all racial subgroups examined, too few non-White patients were enrolled to compare the dose-response of losartan in the non-White subgroup. The LIFE study was a multinational, double-blind study comparing losartan potassium and atenolol in 9193 hypertensive patients with ECG-documented left ventricular hypertrophy. Patients with myocardial infarction or stroke within six months prior to randomization were excluded. Patients were randomized to receive once daily losartan potassium 50 mg or atenolol 50 mg. If goal blood pressure (<140/90 mmHg) was not reached, hydrochlorothiazide (12.5 mg) was added first and, if needed, the dose of losartan potassium or atenolol was then increased to 100 mg once daily. If necessary, other antihypertensive treatments (e.g., increase in dose of hydrochlorothiazide therapy to 25 mg or addition of other diuretic therapy, calcium-channel blockers, alpha-blockers, or centrally acting agents, but not ACE inhibitors, angiotensin II antagonists, or beta-blockers) were added to the treatment regimen to reach the goal blood pressure. Of the randomized patients, 4963 (54%) were female and 533 (6%) were Black. The mean age was 67 with 5704 (62%) age ≥65. At baseline, 1195 (13%) had diabetes, 1326 (14%) had isolated systolic hypertension, 1469 (16%) had coronary heart disease, and 728 (8%) had cerebrovascular disease. Baseline mean blood pressure was 174/98 mmHg in both treatment groups. The mean length of follow-up was 4.8 years. At the end of study or at the last visit before a primary endpoint, 77% of the group treated with losartan potassium and 73% of the group treated with atenolol were still taking study medication. Of the patients still taking study medication, the mean doses of losartan potassium and atenolol were both about 80 mg/day, and 15% were taking atenolol or losartan as monotherapy, while 77% were also receiving hydrochlorothiazide (at a mean dose of 20 mg/day in each group). Blood pressure reduction measured at trough was similar for both treatment groups but blood pressure was not measured at any other time of the day. At the end of study or at the last visit before a primary endpoint, the mean blood pressures were 144.1/81.3 mmHg for the group treated with losartan potassium and 145.4/80.9 mmHg for the group treated with atenolol; the difference in systolic blood pressure (SBP) of 1.3 mmHg was significant (p<0.001), while the difference of 0.4 mmHg in diastolic blood pressure (DBP) was not significant (p=0.098). The primary endpoint was the first occurrence of cardiovascular death, nonfatal stroke, or nonfatal myocardial infarction. Patients with nonfatal events remained in the trial, so that there was also an examination of the first event of each type even if it was not the first event (e.g., a stroke following an initial myocardial infarction would be counted in the analysis of stroke). Treatment with losartan potassium resulted in a 13% reduction (p=0.021) in risk of the primary endpoint compared to the atenolol group (see Figure 1 and Table 3); this difference was primarily the result of an effect on fatal and nonfatal stroke. 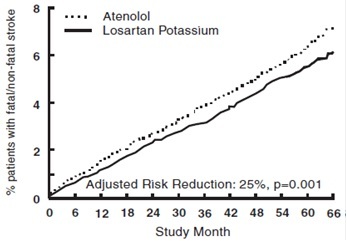 Treatment with losartan potassium reduced the risk of stroke by 25% relative to atenolol (p=0.001) (see Figure 2 and Table 3). Kaplan-Meier estimates of the primary endpoint of time to cardiovascular death, nonfatal stroke, or nonfatal myocardial infarction in the groups treated with losartan potassium and atenolol. The Risk Reduction is adjusted for baseline Framingham risk score and level of electrocardiographic left ventricular hypertrophy. 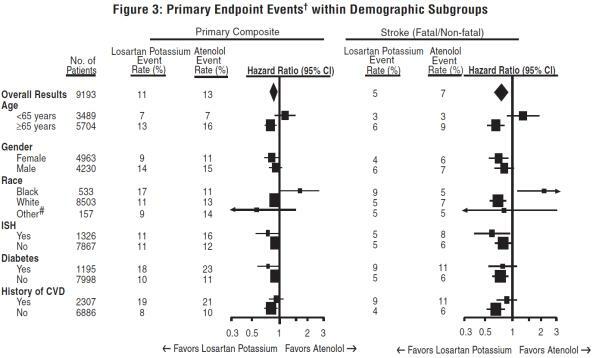 Kaplan-Meier estimates of the time to fatal/nonfatal stroke in the groups treated with losartan potassium and atenolol. The Risk Reduction is adjusted for baseline Framingham risk score and level of electrocardiographic left ventricular hypertrophy. 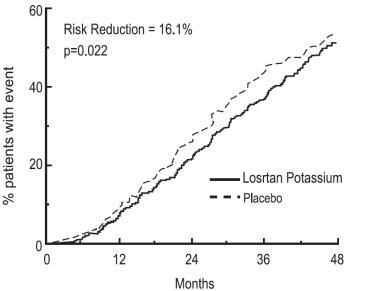 Although the LIFE study favored losartan potassium over atenolol with respect to the primary endpoint (p=0.021), this result is from a single study and, therefore, is less compelling than the difference between losartan potassium and placebo. Although not measured directly, the difference between losartan potassium and placebo is compelling because there is evidence that atenolol is itself effective (vs. placebo) in reducing cardiovascular events, including stroke, in hypertensive patients. Other clinical endpoints of the LIFE study were: total mortality, hospitalization for heart failure or angina pectoris, coronary or peripheral revascularization procedures, and resuscitated cardiac arrest. There were no significant differences in the rates of these endpoints between the losartan potassium and atenolol groups. For the primary endpoint and stroke, the effects of losartan potassium in patient subgroups defined by age, gender, race and presence or absence of isolated systolic hypertension (ISH), diabetes, and history of cardiovascular disease (CVD) are shown in Figure 3 below. Subgroup analyses can be difficult to interpret and it is not known whether these represent true differences or chance effects. † Adjusted for baseline Framingham risk score and level of electrocardiographic left ventricular hypertrophy. The RENAAL study was a randomized, placebo-controlled, double-blind, multicenter study conducted worldwide in 1513 patients with type 2 diabetes with nephropathy (defined as serum creatinine 1.3 to 3.0 mg/dL in females or males ≤60 kg and 1.5 to 3.0 mg/dL in males >60 kg and proteinuria [urinary albumin to creatinine ratio ≥300 mg/g]).Patients were randomized to receive losartan potassium 50 mg once daily or placebo on a background of conventional antihypertensive therapy excluding ACE inhibitors and angiotensin II antagonists. After one month, investigators were instructed to titrate study drug to 100 mg once daily if the trough blood pressure goal (140/90 mmHg) was not achieved. Overall, 72% of patients received the 100 mg daily dose more than 50% of the time they were on study drug. Because the study was designed to achieve equal blood pressure control in both groups, other antihypertensive agents (diuretics, calcium-channel blockers, alpha- or beta-blockers, and centrally acting agents) could be added as needed in both groups. Patients were followed for a mean duration of 3.4 years. The study population was diverse with regard to race (Asian 16.7%, Black 15.2%, Hispanic 18.3%, White 48.6%). Overall, 63.2% of the patients were men, and 66.4% were under the age of 65 years. Almost all of the patients (96.6%) had a history of hypertension, and the patients entered the trial with a mean serum creatinine of 1.9 mg/dL and mean proteinuria (urinary albumin/creatinine) of 1808 mg/g at baseline. The primary endpoint of the study was the time to first occurrence of any one of the following events: doubling of serum creatinine, end-stage renal disease (ESRD) (need for dialysis or transplantation), or death. 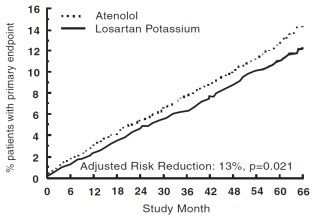 Treatment with losartan potassium resulted in a 16% risk reduction in this endpoint (see Figure 4 and Table 4). Treatment with losartan potassium also reduced the occurrence of sustained doubling of serum creatinine by 25% and ESRD by 29% as separate endpoints, but had no effect on overall mortality (see Table 4). Losartan potassium tablets USP are supplied as follows:Losartan Potassium Tablets USP, 50 mg are green colored, oval shaped, biconvex film-coated tablets debossed with ‘E’ on one side and ‘4’ and ‘6’ separated by scoreline on other side. NDC 60760-125-30 BOTTLES OF 30NDC 60760-125-90 BOTTLES OF 90Store at 20° to 25°C (68° to 77°F); excursions permitted to 15° to 30°C (59° to 86°F) [see USP Controlled Room Temperature]. Keep container tightly closed. Protect from light. Patient Information Losartan Potassium Tablets USP(loe sar' tan poe tas' ee um)25 mg, 50 mg, 100 mg Rx onlyRead the Patient Information that comes with losartan potassium tablets before you start taking them and each time you get a refill. There may be new information. This leaflet does not take the place of talking with your doctor about your condition and treatment. What is the most important information I should know about losartan potassium tablets? Losartan potassium tablets can cause harm or death to an unborn baby. Talk to your doctor about other ways to lower your blood pressure if you plan to become pregnant. If you get pregnant while taking losartan potassium tablets, tell your doctor right away. What are losartan potassium tablets? Losartan potassium tablets is a prescription medicine called an angiotensin receptor blocker (ARB). It is used: alone or with other blood pressure medicines to lower high blood pressure (hypertension). to lower the chance of stroke in patients with high blood pressure and a heart problem called left ventricular hypertrophy. Losartan potassium tablets may not help Black patients with this problem. to slow the worsening of diabetic kidney disease (nephropathy) in patients with type 2 diabetes who have or had high blood pressure. Losartan potassium tablets have not been studied in children less than 6 years old or in children with certain kidney problems. High Blood Pressure (hypertension). Blood pressure is the force in your blood vessels when your heart beats and when your heart rests. You have high blood pressure when the force is too much. Losartan potassium tablets can help your blood vessels relax so your blood pressure is lower. Who should not take losartan potassium tablets? Do not take losartan potassium tablets if you are allergic to any of the ingredients in losartan potassium tablets. See the end of this leaflet for a complete list of ingredients in losartan potassium tablets. “What is the most important information I should know about losartan potassium tablets?” are breastfeeding. It is not known if losartan potassium passes into your breast milk. You should choose either to take losartan potassium tablets or breastfeed, but not both. Potassium supplements salt substitutes containing potassiumother medicines that may increase serum potassiumwater pills (diuretics) lithium (a medicine used to treat a certain kind of depression) medicines used to treat pain and arthritis, called non-steroidal anti-inflammatory drugs (NSAIDs), including COX-2 inhibitorsother medicines to reduce blood pressure How should I take losartan potassium tablets? Take losartan potassium tablets exactly as prescribed by your doctor. Your doctor may change your dose if needed. Losartan potassium tablets can be taken with or without food. If you miss a dose, take it as soon as you remember. If it is close to your next dose, do not take the missed dose. Just take the next dose at your regular time. If you take too much losartan potassium, call your doctor or Poison Control Center, or go to the nearest hospital emergency room right away. What are the possible side effects of losartan potassium tablets? Losartan potassium tablets may cause the following side effects that may be serious: Injury or death of unborn babies. See “What is the most important information I should know about losartan potassium tablets?” Allergic reaction. Symptoms of an allergic reaction are swelling of the face, lips, throat or tongue. Get emergency medical help right away and stop taking losartan potassium tablets. Not a complete list of side effects. For a complete list, ask your doctor or pharmacist. How do I store losartan potassium tablets? Store losartan potassium tablets USP at 59°F to 86°F (15°C to 30°C).Keep losartan potassium tablets in a tightly closed container that protects the medicine from light. Keep losartan potassium tablets and all medicines out of the reach of children. General information about losartan potassium tablets Medicines are sometimes prescribed for conditions that are not mentioned in patient information leaflets. Do not use losartan potassium tablets for a condition for which it was not prescribed. Do not give losartan potassium tablets to other people, even if they have the same symptoms that you have. They may harm them. This leaflet summarizes the most important information about losartan potassium tablets. If you would like more information, talk with your doctor. You can ask your pharmacist or doctor for information about losartan potassium tablets that is written for health professionals. What are the ingredients in losartan potassium tablets? Inactive ingredients: microcrystalline cellulose, lactose monohydrate, pregelatinized starch (maize), low substituted hydroxypropyl cellulose, magnesium stearate, hydroxypropyl cellulose, hypromellose 6 cP, titanium dioxide, FD&C blue #2/indigo carmine aluminum lake, D&C yellow #10 aluminum lake, and purified water.